This photo and these women are not only mystic and beautiful on their own, but the whole image really gives me Solange-esque vibes--very intense and even a little dangerous. "Style is a way to say who you are without having to speak." – Rachel Zoe aka one of my favorite quote because of the overwhelming truth of it. Solange Knowles I DECIDED from M2 Management on Vimeo. These two masculine, suit looks are definitely my top two favorites. She combines her free flowing feminitiy with masculinity by wearing this suit with free flowing hair and no shirt underneath. This whole look contrasts a firm edginess with an abundant ethereal quality. AND THE CLOUD PANTS. THE CLOUD PANTS!!! Yall I basically love anything with clouds. I COULD DIE AND GO TO HEAVEN AND I'D BE KICKIN IT ON THESE CLOUDS because 1) They're cloud print and 2) They've been blessed by Solange's legs. 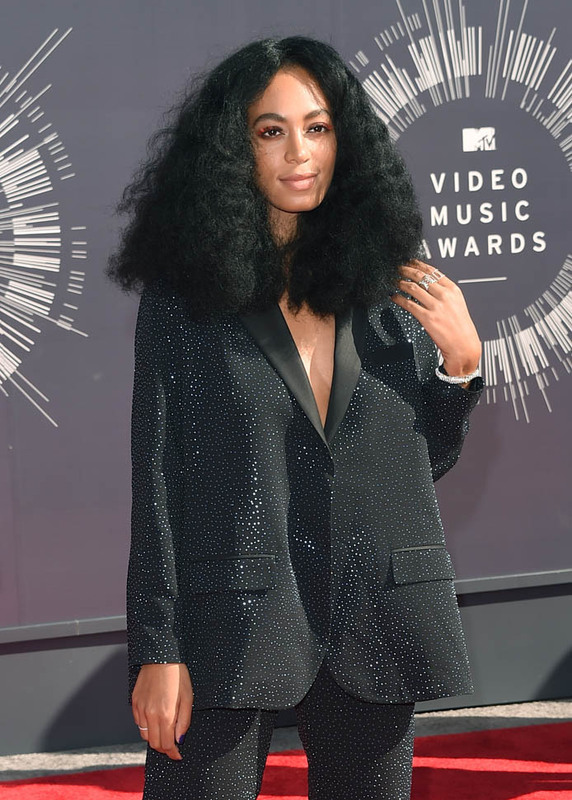 More of Solange's urban, vintage taste can be found in these looks and it all adds up to her cool factor. Style really is unrestricted to clothing; it seeps into the way you live your life and the way you just are, and her style, her lifestyle, seems to be exactly that. Unrestricted, free, natural, and spiriful <3 So even beyond her outrageously amazing wardrobe, Solange is someone I consider to be an icon in general. She does it all and she kills everything she does! She's a singer, an actress, a style icon, a mother, a wife, and she's playing all of these roles cooly and so effortlessly. The fluid movement in this dress looks like it could literally blow you away. I think I'm a little pissed at how perfect these two are, but, nonetheless, best of luck to this stylish power couple! Solange is a queen. Very underrated, but still so beautiful and carefree. I have so much love and respect for her! I agree x10 <3 Kinda makes you want to join the Knowles family for a little while to see if the queen gene will rub off on you too. Oh man... her style is so amazing. Every look kills me. I love her!!! The fashion quotes you added are super inspiring too! Solange is everything. Like she's so revolutionary but in the simplest way. I mean, she's just living life, doing her thing, getting this money, being the epitome of care free black girls and all in the loveliest aesthetics possible.